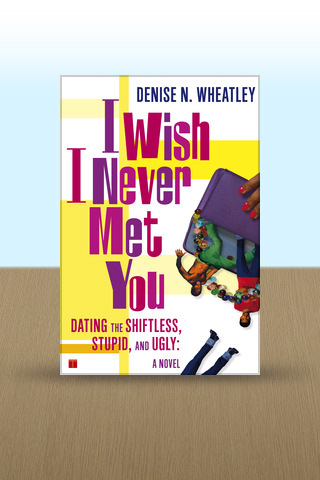 Sitting at a little over 200 pages, I Wish I Never Met You originally attracted me because the cover blurb states that the novel is a "hilarious, uncensored confession of one woman, reeling from a lifetime of dating disasters...she'll have you laughing out loud." 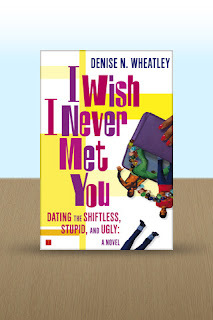 A photograph of the smiling and beautiful author Denise N. Wheatley is included on the novel's back cover, so I'm thinking this is going to be a funny and light read that I can't wait to dig into. And it is! But only for the first chapter about Doug the Heinous Dragon. I got a little lost in the chapter following Doug, about Preston the Project Mishap, in which the narrator describes going to a club and mingling among "Frito-laced, bodussy-type smog," which is a form of slang I still don't get even after asking my very urban friends about it. However, being the honest, goody two-shoes critical reviewer I am, I decided to stick with the novel until the end and give it a fair chance. I Wish I Never Met You is entertaining, for sure, but the narrator is pretty sickening, shallow, and difficult to relate to, even for readers who have also truly dated a barrage of yucky, loser men. The book is not really humorous at all, but disturbing on many levels, especially when we get to a story near the end where the narrator is so fed up with a man that she forces him to drink her urine by peeing in his mouth. Upon reading that chapter, I became so offended that I had to put the novel down for about a week. At least I know what I'm getting when I pick up copies of Penthouse Unleashed, but I was totally unprepared for the urine scene, and it pretty much spoiled the entire book for me. It almost seems as if Wheatley's editor may have initially agreed with me about the "pee" part, which Wheatley mentions in the acknowledgments at the end of the book. I'll definitely say this: I Wish I Never Met You is unforgettable, but not in the positive sense. As always, I have difficulty writing negative book reviews, but sometimes it has to be done. I DO NOT recommend I Wish I Never Met You to anybody. I kind of wish I had never read this book! If you're a fan of urban fiction or a master of slang, you may understand this book better than I did, but even then, I'm not sure you will like it. You'll have better luck with enjoying Penthouse's Unleashed short story collections. Other books by Denise N. Wheatley include Wards of the Women and The Road to Bliss. The author is currently working on her 4th novel entitled When It's All Said and Done. Click on any images of the books below to review them in more detail on Amazon.com. Have you read any novels with similar plots? If so, what are they, and what were your thoughts?